The origins of the parish are intimately connected with Saint Louis University. Archbishop Joseph Rosati gave the Jesuits permission to found a parish in conjunction with Saint Louis University. The parish congregation met for several years in the college student chapel dedicated to Saint Aloysius located on Washington Avenue. It was evident from the beginning, however, that the parish would need its own church building. Plans for it were begun; and on April 12, 1840, the cornerstone of the new church was laid. The official establishment of the parish by Archbishop Rosati took place the next year. The new church held its first mass on Easter Sunday 1843. It was situated at Ninth Street and Christy (Lucas) Avenue. 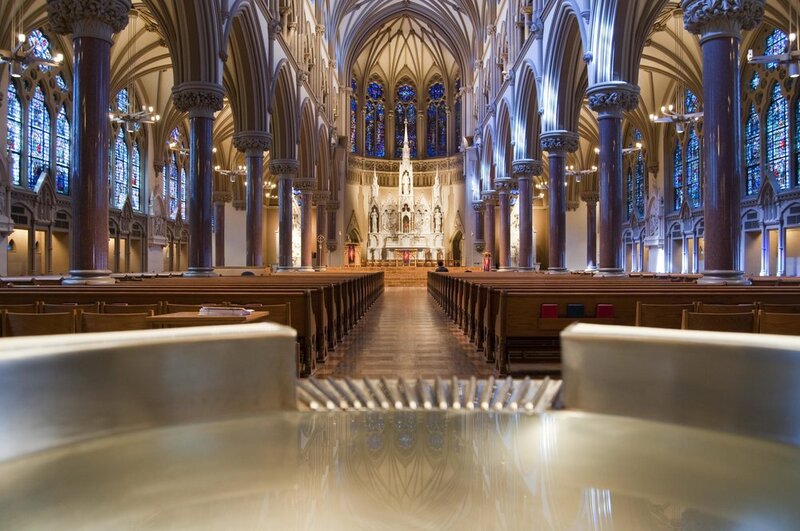 The church was dedicated to Saint Francis Xavier; but, from the first, it was familiarly known as the College Church. It was the first English-speaking parish in the city, and served primarily the growing Irish population of St. Louis. View a short (8 minute) video presentation on the history of College Church by Fr. David Suwalsky, S.J. Soon schools for girls and boys, social outreach programs, and the celebration of the sacraments made St. Francis Xavier a large and thriving parish. It grew alongside of the university to become a fixture in the city. As the city moved west, Saint Louis University (the College had received a University charter in 1832) decided to move with it. In 1867, property was purchased in Lindell's Grove at Grand Boulevard (then Avenue) as a new site for the University. In 1879, Archbishop Kenrick gave the Jesuits permission to build a new church on the site to supplant Saint Francis Xavier College Church at Ninth and Lucas. Plans for the new church were drawn up by the prominent architect Thomas Walsh. In 1883 excavations for the foundations begun, and on June 8, 1884, the cornerstone for the new church was laid by the Most Reverend Patrick J. Ryan, coadjutor to the Archbishop of Saint Louis, assisted by the Right Reverend William H. Gross of the Order of the Most Holy Redeemer, Bishop of Savannah, and by the Right Reverend Joseph Dwenger, Bishop of Fort Wayne. By 1884, the basement was finished and roofed over and for many years served the new congregation of Saint Francis Xavier for its liturgical functions. From that date on, work continued steadily on the upper church as funds became available. The architect, Thomas Walsh, had drawn the preliminary plans for the new church. He also designed DuBourg Hall which for a long time was the sole school building on the new Saint Louis University campus. He died before the construction of the upper part of the new church was begun and the project was taken over by the Chicago architect, Henry W. Switzer. By this time, Father Henry C. Bronsgeest, S.J., a Dutchman, had been appointed pastor. Fr. Bronsgeest was familiar with churches all over Europe and decided that, of all the possible examples that might be emulated, the one he wanted as a model for the College Church was the Cathedral of Saint Colman, in Cobh, Ireland. Saint Colman's was designed by E.W. Pugin, the son of Augustus Welby Pugin, the famous architect who, more than any other, was responsible for the Gothic revival in the 19th century. Father Bronsgeest's pastorate extended from 1888 to 1914. It is by far the longest in term in parish history. It was said that from cornerstone to steeple cross, the College Church is a monument to his zeal for the house of the Lord. He raised the necessary funds and oversaw the entire construction of the upper Church. The final addition to the church building were the stained-glass windows. They were made possible by the generosity of George and Anna Backer. The windows were designed, made and installed by Emil Frei, Jr from 1929-38. They are considered among the finest stained-glass in the country. A major renovation of the College Church took place in the late 1980's. The work was intended to incorporate the liturgical reforms of the Second Vatican Council with the church building. This extensive project reached completion in 1990. The successful renovation resulted in sacred space that complements and facilitates liturgical celebrations. It did so without compromising the integrity of one of the most beautiful church's in St. Louis.